In 2003, director Ang Lee created what seemed to be impossible: a movie about a giant superstrong monster smashing things that's kind of boring. That was HULK. I actually liked this movie at the time, but it doesn't hold up too well twelve years later. Especially compared to the awesome Hulk in the Avengers series. 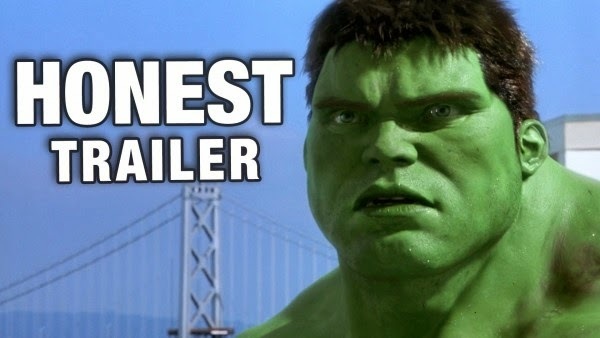 That's why it's about time to take a look at what the trailer would be like if it was honest, thanks to Screen Junkies. Of course, they didn't mention everything, like the unnecessarily convoluted origin. I mean, genetic engineering and nanotechnology and accidental radiation? How hard is it to throw a gamma bomb at Banner? What did you think of Hulk? I watched most of it on HBO a few weeks ago and it is striking how lame the Hulk looks by modern standards. I mean that bright green is just so unnatural. But I'd pretty much watch anything with Jennifer Connelly in it, which maybe it's ironic that her husband is Jarvis/The Vision in the Marvel universe now while she got replaced with Liv Tyler.